Ernest Scott : Bass and His Whaleboat, 1912. Ernest Scott: English and French navigators on the Victorian coast. George Bass's whaleboat, illustration facing page 155 and text pages156 to 158. The footnotes have been reconfigured as endnotes, and linked. [From an engraving by Lesueur, in the Atlas to Peron and Freycinet's "Voyage de decouvertes aux Terres Australes." George Bass, the surgeon of H.M.S. Reliance, was the first man after Cook, to traverse any part of the Victorian coast. In December, 1797, Governor Hunter gave him the use of a whale-boat and six seamen to explore the southern part of the continent; and on the evening of the 3rd of that month, the adventurous little company rowed out of Port Jackson, and set sail on a southern and westward cruise. Bass' portrait shows him to have been a handsome man, with a face evincing a suggestion of keenness and power, firm will and swift decision, behind a refined manner and a lively humour. Cook-was, of course, a far greater man historically, and Flinders was a more accomplished navigator, than can for a moment be claimed for Bass. Yet he was something more than a dashing amateur in this field. The reader of his journal recognises in it the work of a shrewd and clear-minded observer. We do Bass an injustice if we regard his whale-boat voyage simply as an adventure. It was that, indeed, but-the exploration was pursued in a scientific manner; and whoever refers to his writing on any point will find him clear, precise, and dependable. There is, moreover, a certain brilliancy, a touch of romantic daring, about Bass, that seems to mark him as a man born for distinction. Governor Hunter, in an official despatch, characterized him as "a young man of a well-informed mind and an active disposition,"
We read also, in a description of him by a relative, of his "very penetrating countenance." The mystery surround­ing his end will perhaps never be entirely removed; but mean­while we may recognise what he did, with the means available, to have been brave work, worthy of his dauntless character. It may be well at this point to correct an error which has been unfortunately promulgated in the best known modem history of the British Navy. Reference to Governor Hunter's despatches shows that such was not the case. The crew were, therefore, honest British sailors. The convict story is a fabrication. One of his six picked seamen, John Thistle, afterwards rose to the rank of master, in which position he served in the Investigator. Flinders was "much attached" to him, and Thistle Island, in Spencer's Gulf, was named after him. Bass carried provisions for six weeks. His little craft doubled Cape Howe on 20th December. On the last day of the year, he confesses in his journal to have pursued his voyage "in anxious expectation, being now come upon an hitherto unknown part of the coast." On the last night of 1797,(6) at 10 o'clock, there was a bright moon in a cloudless sky, and the adventurers could dis­tinctly see the low, level land on their starboard side. Cramped and uncomfortable as they must have been, they can hardly have failed to feel, at this moment, that their privations were worth enduring. A new year was dawning, and they- these seven hardy Englishmen in their rocking craft, so small a thing that a man could hardly stretch his legs in it without kicking the shins of another- were adding a wide stretch of entirely fresh territory to the map of the world. Ninety-Mile Beach, washed by its long fringe of white foam, breaking in crisp phosphorescent curls under the moonlight, and wondered what generations to come would make of this country, and what they would think, if they spared a thought at all, of him, the hazardous discoverer. If a subject were wanted by a sculptor that should symbolize the moving story of Australian exploration, there could hardly be a better than a picture in marble or bronze of George Bass, with his strong intellectual features, standing erect in his whaleboat, searching the line of the shore, on that voyage when he was winning enduring renown. The chart drawn by Bass to show his course was embodied in a drawing of Bass Strait afterwards published by Flinders. Copies of the original are extremely rare; but there is one in the British Museum and another in the Petherick Collection, Federal Parliamentary Library. On 2nd January Wilson's Pro­montory was discovered; but the name it bears was given, not at the instance of Bass alone, but of himself and Flinders. Mr. E. A. Petherick informs me that he has seen letters written by this Thomas Wilson, who was a London merchant partly engaged in Australian trade ; but I have been unable to gather anything more definite about him. The author of a book about Australia, published in England a few years ago (8) writing of Wilson's Promontory, falls into an error of the kind that is committed by taking statements at second hand, instead of depending upon original authorities. It is alleged that one of the crew of the whaleboat, named William Wilson, "jumped ashore first, and the point was henceforth called Wilson's Pro­montory." 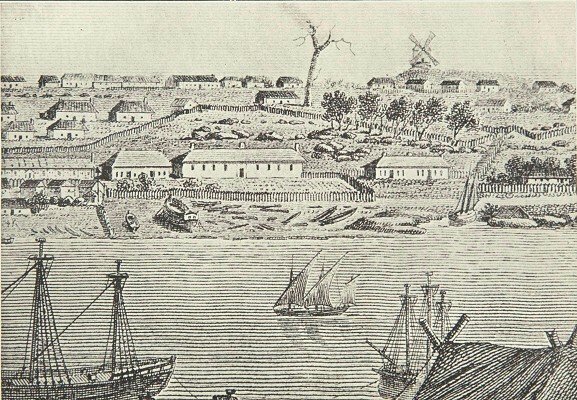 On 5th January Bass discovered Westernport, which he so named "from its relative situation to every other known harbor on the coast." about the pleasing appearance of the surrounding country, upon the incidents of his ten days' sojourn in the port, or upon the return journey to Sydney, where he arrived on Sunday, 25th February. The important point in the development of our subject is that by this voyage of Bass, in 1798, the whole of the eastern coastline of Victoria, from Cook's Point Hicks to Westernport, was made known and its general contours were mapped. Bass did not actually demonstrate that the strait which bears his name was a passage between Tasmania and the mainland; but, as he informed Governor Hunter, the sea "rose to so moun­tainous a height "that there was much reason to conclude "the absence of land blocking egress westward. Indeed he "con­stantly asserted"(11) that the westerly swell rolling in upon Western-port indicated exposure at that situation to the Southern Indian Ocean. In October, 1798, Bass and Flinders together, in the Norfolk, 25 tons, proved that there was a strait by sailing through it. This piece of investigation was the principal object of their voyage. Their sloop was a tiny craft for a stiff bit of navigation, but she was a fine sea-boat, whose qualities elicited the admiration of Flinders. "Seas that were apparently determined to swallow her up," he wrote, "she rode with all the ease and majesty of an old experienced petrel." 7. Flinders Voyage to Terra Australis, I., p. cxv. 8. The Coming of the British to Australia, by Ida Lee (London, 1906), p. 51. 9. H.R., III., 321 and 322. 10. Governor King, in a document dated 1801, described Wilson's Promontory as "named by Lieutenant Flinders." 11. Flinders in H.R., III., 816. 12. Flinders, H.R., III., 798. George Bass' Whaleboat, Sydney Cove, 1802. "Voyage de decouvertes aux Terres Australes." in front of the line of fencing. Voyage de Découvertes aux Terres Australes… Sur les corvettes le Géographe, le Naturaliste, et la goelette le Casuarina, pendant les années 1800, 1801, 1802, 1803 et 1804. BAUDIN, François PERON, Louis FREYCINET. Three volumes, small and large quarto; the two-volume text with portrait frontispiece and two folding tables; the two-part large quarto atlas (bound in one volume) containing 40 plates (23 coloured and two folding) and 14 maps (two double-page and folding). The official account of the important Baudin voyage to Australia and the Pacific. As Baudin died in the course of the voyage, the narrative was begun by Péron, the expedition's naturalist, and completed by Freycinet after Péron's death. Volumes on hydrography were separately published and actually distributed by a different bookseller. This is the format in which the voyage publication is normally seen with two volumes of text and two parts of the atlas, often referred to as the general reader's set. "Lesueur's scientific work runs parallel to artistic work of great importance. He was at one and the same time draughtsman and painter, naturalist and landscape artist. His talent was recognised in France in his own lifetime, by the award… of the silver medal of the Société des Beaux-Arts…"
- Baudin in Australian Waters, page 26. 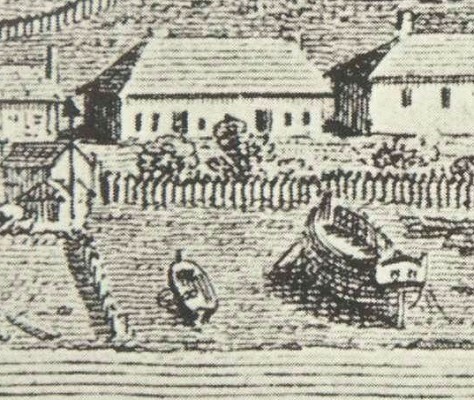 The well-equipped Baudin expedition was one of the great French voyages of discovery, and made significant visits to Western Australia, Tasmania and Sydney. The coastal explorations are commemorated by numerous place-names along the Australian coast, especially in Tasmania and Western Australia. The French and English completed their circumnavigations of the Australian continent at approximately the same time, but Flinders's imprisonment by the French on Mauritius meant that it was this French account which contained the first complete and detailed chart of the Australian continent to appear in print. This map, often said to have been at least partly based on Flinders's charts and papers seized by the French, is one of the most beautiful, as well as one of the most famous of all maps of Australia. English and French navigators on the Victorian coast. 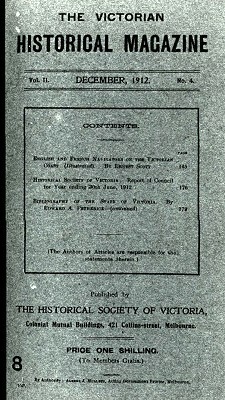 Volume 2 Number 4, December 1912. Geoff Cater (2015) : Ernest Scott : George Bass and his Whaleboat, 1912.